What an interesting mind James Turrell has. I had been in his Skyspace installation at the National Gallery before and been entranced by several elements of it, but knew little of the rest of his work. The big exhibition at the NGA has fixed that gap. I had read publicity material in the lead up to the show but still walked in with only a vague idea of what I would encounter. This exhibition is engrossing and it is fun. 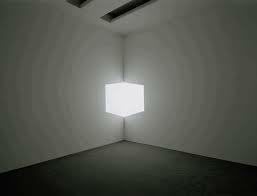 One room has a deep fog filled lit space that looks like you are viewing through thin cheese cloth. When I got close I was so intrigued with its ethereality that I actually walked inside it finding no cheese cloth. An attendant asked me to come back as I was actually inside the artwork. Another room had a set of bewitching holograms. Further on there was a softly lit fog that looked like a projection on the wall but was really another space of indeterminate depth. He just loves playing tricks with light and space and our perception of them. I wanted to throw myself in works of art. I created shadow puppets on brightly coloured spaces. I have rarely had so much fun in an exhibition. 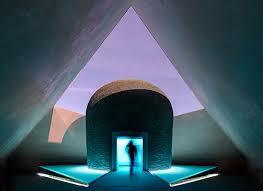 Turrell is famous for large walk in sculptural creations like the one out front of the NGA. He is a pilot, has a fascination with lots of things including use of craters and natural landforms in getting a sense of light and perception. I have included some pics below taken from the internet, but feel silly doing it. 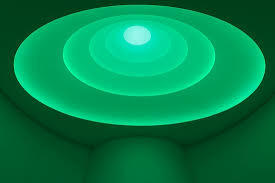 No 2D jpeg can give any close sense of a Turrell work. This exhibition was a well spent $25. 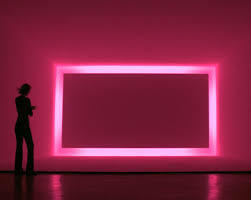 This entry was posted in abstract art, Art, Canberra, Contemporary Art, Painting and tagged James Turrell, James Turrell: A Retrospective, National Gallery of Australia by stephenrrandall. Bookmark the permalink.